The memories of outdoor markets and the hot jam doughnut van, me and my brother burning our tongues and fingers because we couldn't wait, even though the flavour somewhat lacjed after we’d burnt our impatient tongues! I like doughnuts J But today I went for a healthier doughnut by choosing to bake and not fry, and opting out of a refined sugar glaze. The consistency and fluffiness of the resulting doughnut is a win in my opinion, however, it does lack the deliciously almost crisp crust that are familiar to those traditional fried doughnuts. If that’s what you’re after then by all means shallow-fry, deep-fry, the world is your doughnutty oyster! I won’t complain and I will probably even envy you, shh! But if you are like me, and you appreciate a little something old, mixed with a little something new and you can handle calling a ball of baked, pillow-like dough a doughnut theeen...well. I don’t really know where that sentence was going, I think I got stuck on “pillow-like”. SO, these doughnuts may be different, they’re not uber sweet, nor uber fried like your traditional doughnuts, but yes, they are good. They may not change your life and make the sky rain pistachios (we can still hope) but they’re perfect for an impromptu visit to a friend in need of soft, dough-y comfort. 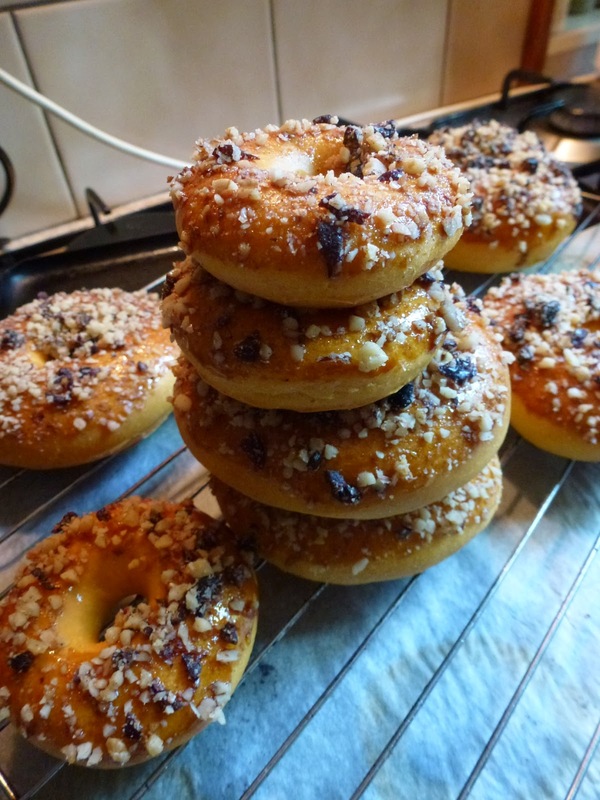 But, like I said, they are YOUR doughnuts, so if you want a doughnut-ier doughnut, I suggest following Pinch Of Yum’s recipe for instructions on how to fry, then I suggest you send one my way. Mix all the ingredients except the flour, whisking until smooth. Add the flour and knead for 10 minutes, best by hand. Dough will be fairly sticky but try to refrain from adding too much more flour, you want a light doughnut. The faster you knead it the less it will stick. Place the dough ball in a greased, covered bowl and allow to rise for about an hour. Roll out the dough to ½ inch thick, depending how high and gorgeous you like your doughnuts, and cut out doughnut shapes, I used a drinking glass and the neck of a juice bottle. Place doughnuts in hot oven and bake for about 15 to 20 minutes, when they are gorgeous, puffed and golden looking they are sure to be ready, turn one over and check the base, even poke one. When satisfied readiness is achieved, pull from the oven and attack your doughnuts with the following topping. Carefully brush Pomegranate molasses over each doughnut, keeping in mind the flavour intensity. You can even mix pomegranate molasses with powdered sugar for more of a “glaze”. In a food processor blend the walnuts and cranberries until a fine-ish crumb forms (I would have done it finer than in my pictures), pour into a shallow plate. Gently but firmly press each doughnut, molasses side down, into the crumb mixture, cross fingers and hope for a generous coating. Proceed with each doughnut, pausing in between to eat them. 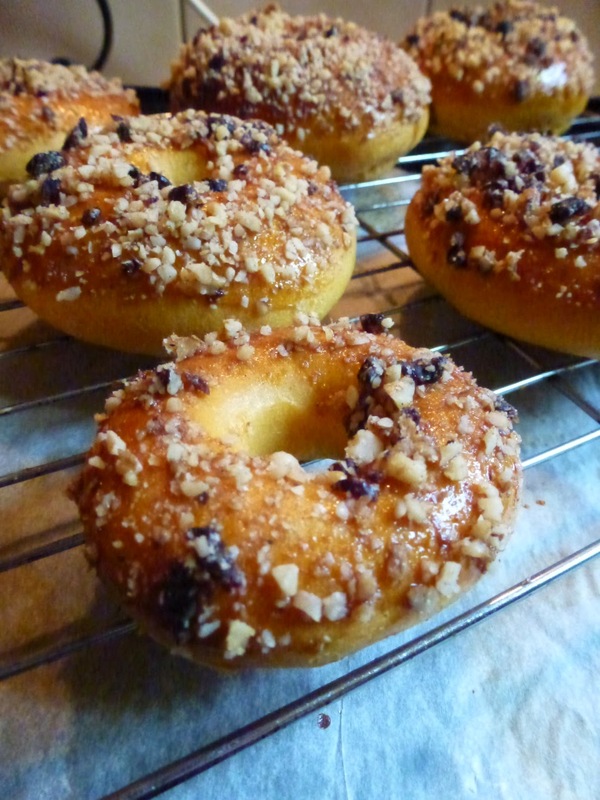 Allow extra crumb topping to tip over doughnuts and to eat over natural yogurt, I highly recommend! 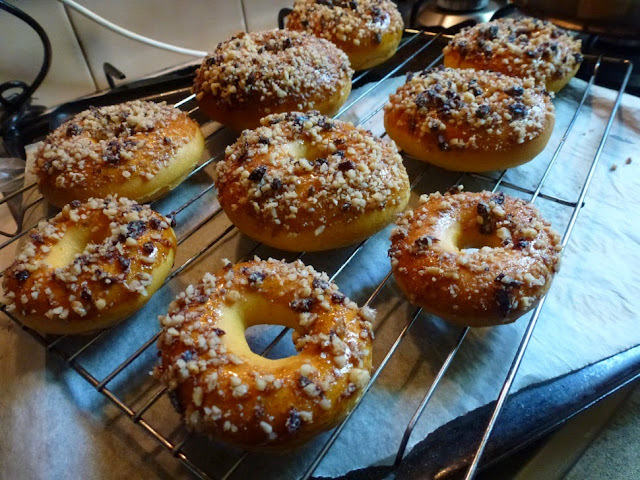 *If the topping does not add enough sweetness to the doughnuts for your liking feel free to sprinkle some icing sugar over or mix some icing sugar or honey into the pomegranate molasses before brushing on. What’s your favourite memory of doughnuts? And how would you eat these ones? I think these went great on a plate with honey and pomegranate molasses into which I dipped torn bits of doughnut, heaven!